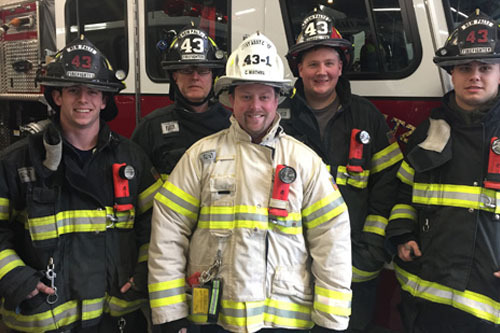 Left to right: New Paltz Firefighter Ethan Smith, Firefighter Bill Murray, First Assistant Fire Chief Cory Wirthmann, Third lieutenant RJ Iseldyke and Firefighter Ahren Robertson. That volunteer firefighters are heroes is not an idea that’s often in dispute; these are the people who run into burning buildings at any hour of the day or night. However, much of the work that members of the village’s fire company do to protect the safety of their neighbors is dusty, dry stuff that stays behind the scenes, and that suits them just fine. Case in point: the ISO rating of the New Paltz village fire department has been improved by one point this year, going from five to four on a scale on which a “one” means you’re the creme de la creme. It’s a scale developed by insurance industry insiders (first assistant fire chief Cory Wirthmann says the initialism refers to the “Insurance Service Organization), and is used to evaluate fire departments on very technical aspects of the job. While the improvement can translate into very real insurance rate reductions for homeowners, few will ever understand how it’s calculated. Nevertheless, lowering the score established by this entirely voluntary process entailed stepping up efforts by every member of the organization. It’s a big enough deal that the department chiefs are seriously considering having the score painted on the new truck before it’s delivered, and firefighters are much more interested talking about it than, for example, saving someone’s life. Wirthmann is more than happy to talk about the effort to lower this key benchmark, which is a lens through which everything that happens in the department can be seen. It begins with the infrastructure that’s already in place throughout the village and in some other portions of the town. “Without fire hydrants,” Wirthmann explained, “our score would be a ten.” Typically, departments serving areas with no hydrants don’t even bother with the evaluation; there are thousands of these throughout the country. Firefighters are far more effective thanks to the hydrant system, which is maintained by municipal employees. In fact, the score is only a four in the area with hydrants; elsewhere the community is ranked “4Y.” “We can’t control that, but we can other parts” of the score,” Wirthmann said. Beyond hydrants, the ISO score for a fire department hinges on equipment, training and record-keeping. The score is intended as a tool by which any two departments can be compared, regardless of budget and size. For the 2016-17 budget year, the fire department is running on about $350,000; village trustees also committed to replace the 22-year-old pump truck at a cost of $480,724. While that’s close to one million dollars in total, it’s a relatively small amount given what’s asked of these unpaid volunteers. Trucks are expensive, Wirthmann acknowledged, and the chief is sensitive to questions about why eight different ones are needed for a community of this size. “They each do something different,” he said. “We’re not just being greedy.” The new truck, for example — it’s properly called a “source pumper” — makes fighting fires throughout the town feasible, even when hydrants are not convenient. With it, firefighters can pump water from a lake, pond or distant hydrant, and then supply the attack engines (classic fire trucks) at the scene. Each of the fire houses has an attack engine, which is the only type of truck duplicated in the fleet. One of the largest trucks in the fleet is the ladder, which is needed if a building of three stories or taller is afire. While there is continuing scrutiny about the allowed height of buildings in the village, those towers on the college campus also fall under village fire protection. An engine that gets used whether or not there’s a fire is the rescue truck, which is equipped with the tools for automobile accidents, water and ice rescues, building fires and more. This is the truck that brings the jaws of life to the scene; it’s also got an air-replenishment system to refill the tanks firefighters use to breathe when surrounded by flames. Each of the chiefs also has a quick-response command vehicle at their disposal, and that’s far from vanity. It means that the one on duty can go directly to the scene with all the necessary gear, usually assessing the situation before any truck arrives. That counts toward response rate in the ISO score, because it means there’s often a deployment plan in place when the first truck arrives. How long that takes depends on who is available: other than the officer, a truck needs a driver, as well as two firefighters, before the crew can respond. At certain times — during the workday, for example — the truck may leave one person short, but it’s also possible to have as many as 28 firefighters show up for a single incident. It’s true that there are no women on the active roster right now, but there have been before and the chief said that they are always welcome to volunteer. The new firehouses have segregated sleeping areas anticipating that very fact. Regardless of gender, volunteering to be a firefighter is a big commitment. Often, Wirthmann said, “You don’t sit down long enough to finish a meal,” because when a call comes in, lives can be on the line. That, plus the necessary training, can make recruiting new firefighters challenging. Wirthmann said they are exploring ways to diversify the obligation, such as identifying residents with a commercial driver’s license that could just drive the trucks, while not training to fight fires. That’s a new option just this year, he said. There’s also fire police, volunteers trained to direct traffic around an incident. “We don’t want to turn anybody away,” he said. There’s a statewide effort called RecruitNY that takes place in the spring, but interested residents can knock on the door to the firehouse any time to ask questions. It’s locked — that’s a Homeland Security rule — but anyone is welcome inside, he said, and for any reason: they’ve often helped passersby shelter during sudden rain squalls. Record-keeping brings it all together, because that’s the evidence of equipment maintenance and training that is needed to justify a lower score. “The inventory on paper relates to our ability to do the job,” Wirthmann said. Improving records management practice has been a focus since Wirthmann took office together with chief Dave Weeks and second assistant chief Dylan Babcock, and he said that they have relied on village officials to give them support in that area. Indirectly, the relationship with elected officials has also made a difference, Wirthmann said. There have been periodic flare-up of tensions over the years, such as when a village fiscal crisis last decade led to the directive that department heads obtain authorization to spend money already budgeted; community members donated bottled water to firefighters in solidarity. Under Mayor Tim Rogers and Town Supervisor Neil Bettez, there’s a culture of communication. “We approached them about meeting monthly, and they immediately agreed,” Wirthmann said, characterizing them as “hungry for information.” In addition, Wirthmann works in the building department and serves as the municipality’s first-ever fire inspector. Working with other village personnel, such as the DPW workers who maintain the hydrants and the building inspectors who identify safety issues, is evidence of that culture of communication and cooperation. Many town residents recently benefited from Red Cross volunteers installing new smoke alarms; fire officials were also involved in that, and yes, it did contribute to the lowered ISO score. Wirthmann doesn’t think that the planned relocation of fire houses will have much effect on response times. Using state money allocated to NY Rising, a new station 2 is slated to be built west of the Wallkill River on the site of the village water treatment plant on Mountain Rest Road; the existing station 2 will be upgraded and turned into station 1. As few of the volunteers live in the village proper, the time to get to the station after the call is unlikely to be increased. It will improve some aspects of the job, however: right now, drivers have to contend with parking four trucks in a space that only has three bay doors. “We’ve outgrown the space,” the chief said. While the ISO score is one way that insurance rates are impacted, homeowners are also asked the distance to the nearest hydrant and firehouse. Wirthmann does not expect the firehouse distance ranking to negatively impact any property owners in New Paltz. Both of the new firehouses are being designed by an architect who is also a firefighter, Wirthmann said, and while they won’t have all the newest features, they should adequately serve the community for the next 30-50 years. One feature that won’t be coming back is the fire pole. There was one in the firehouse on Church Street, where Krause’s Chocolates is now located, but fire poles are no longer considered safe. It’s one icon of firefighting which is being relegated to storybooks. The chief is already planning on the steps to get the ISO score lowered down to a three. “They tell you exactly how you can do that,” he said of the assessors and their multi-page report. The village department is one of just 6,749 ranked at ISO four, and a lower score would put them in more rarefied territory. He believes that would put them on par with Kingston, which has a leg up because those firefighters are full-timers, not volunteers. With more detailed records of the training volunteers are already undertaking, Wirthmann believes it’s achievable. Even though this lowered score is a source of a lot of pride, it’s only representative of what local volunteers are actually doing. They prefer not to draw attention to those incidents themselves, in part by redirecting conversations to the professionalism evident in an ISO four firehouse. Wirthmann said that he’s not alone in feeling awkward when he is approached and thanked by someone he saved. “It’s just our job,” he said.